So...is your bracket ruined, too? Oh, yeah. That sound you just heard....the big thud? Yeah, that's me giving up on Eric Chavez forever. Stick the Pavano in him, Oakland A's fans, he's done. Can anyone explain to me why Donnie Walsh would want to come to the New York Knicks? In all seriousness, they have got to be the worst franchise in all of professional sports. Up until recently, they had the highest team salary in the NBA, despite having one of the worst records in the NBA. They've been in the playoffs once since 2001, again despite regularly having the highest payroll in the league. They get brought up on sexual harassment charges...by their own employees...and I'm not talking about players getting charged, I'm talking about upper management. And the situation Isiah is handing Walsh is a disaster one not likely to get out of any time soon. The team is a morass of overpaid, un-tradeable miscreants, neverwas's and malcontents—the kind that drives Larry Brown, a legend of basketball to get himself fired after one year. The owner, James Dolan, has got to classified as either completely incompetent, or a total Cretan. The kind of owner that gives Allan Houston a 6-year, 100 million-dollar deal when no one else was bidding. The kind that hires Larry Brown to a 5-year, 50-million dollar deal, fires him after one season, agreeing to pay Brown 18 million just to walk away. 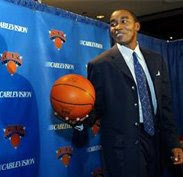 Who is still paying Don Chaney and Lenny Wilkens, after both tried to, and failed, to coach the New York Knicks. The kind that makes mid-1980s Steinbrenner look smooth and thoughtful. So, why would Donnie Walsh want to come here, into this zoo, when he's esteemed for doing a great job at a respected organization? Nothing in the Pacer organization could bad enough to want to come here. In case any of you follow this kind of stuff...the University of Texas has 16 football commitments signed up...for NEXT Year's class. 16 kids, ready to sign for the 2009 class! And 7 of them are serious blue-chippers, with one of the being a five-star QB. That's 7 flavors of preposterous; to have that many kids this early. I said it before but...IF the Blue Jays could stay healthy, they could be a big problem for the powers in the AL East. And then last week we hear about Casey Janssen going down for the season. Uh oh. Now we hear that Greg Zaun is on the DL, that B.J. Ryan is "hoping" for a mid-April return, Scott Rolen is also "hoping" to be back shortly after opening day, and A.J. Burnett, who finally pitched with his full repertoire for the first time all spring training, got shelled for 7 runs in five innings. Wooof, that's a bad smell coming out of Toronto right now. And lastly, today is the birthday of one, Howard William Cohen, A.K.A. Howard Cosell. For those of you old enough to remember Cosell, he is, like him or hate him, a singular figure, and probably the most unique commentator in the history of sports. From coining the name of ESPN's recent mini-series "Ladies and Gentlemen, the Bronx is burning." to his famous announcement during a Monday Night Football game of John Lennon's death to his brilliant work in hosting "Battle of the Network Stars," Cosell was a true journalist. But perhaps I'll best remember him as Woody Allen remembered him...fast forward to 2.40 to see what I mean. Actually, watch the whole clip, it's pretty funny. 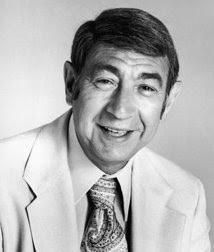 Howard Cosell's appearance on The Odd Couple was great, too. I'll never forget it. I think Howie brought intellectualism to sports broadcasting, and not in a Dennis Miller way where you're scratching your head trying to remember who Diogenes was. One of a kind. My NCAA bracket looks like a third world country's government org chart after a successful uprising. Most of the names are crossed out already. (That was an intentionally odd simile in homage to Cosell and his style).